BlackFog was founded as a solution to the global problem of Data Privacy Protection. Before the advent of rich mobile devices in 2007 with the first iPhone, the concept of losing your computer was considered a major problem for individuals and corporations. Many solutions were developed to try and prevent the theft of these devices with limited success. As we have moved to a mobile device based economy with focus around data creation, storage, cloud servers and information sharing the idea of losing your device has become secondary to the information that is stored on it. Corporations and individuals are more concerned with losing their data first and foremost. When you can lock your phone and get a replacement with in minutes or hours, the device itself becomes secondary. BlackFog was conceived to fill the gap that exists in the market between the current security solutions that focus on preventing access through intrusion detection systems, such as Firewalls (pre-infection) and Anti-Virus/ Malware solutions (post-infection) that remove known infections after they have been discovered. As a part of a layered approach to security BlackFog sits between these two types of solutions and prevents data loss by preventing outbound data connections when it discovers anomalies in the behavior of applications or remote servers. 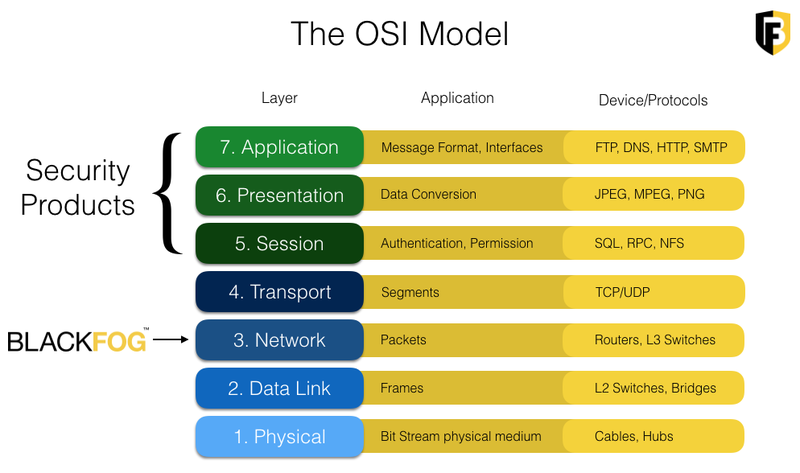 By sitting just above the networking hardware itself at layer 3 of the networking stack it is able to see the traffic before it passes the information onto the operating system. Therefore it is possible to prevent any damage before it occurs. Examples include preventing data flowing outside defined geo-fences, destination countries or certificate key exchange where ransomware applications try to encrypt files on your hard drive. This new market opportunity which we define as “Cyber Privacy” focuses on preventing data loss (data leaving the device), data profiling (behavioral analysis) and data collection (forensics). BlackFog is currently the only product in this space that tackles this problem at all these levels simultaneously. Other “Privacy” products that currently exist focus exclusively on “Cleaning” your device, by removing trace activity from other applications. This is defined as forensic information using BlackFog terminology. Adjacent products in the category include Firewall solutions that focus on intrusion detection. However these products focus specifically on blocking ports or anomalies in protocols that are well documented. Often existing at the edge of the network as dedicated hardware and extremely expensive these solutions focus on inbound packets. Anti-virus and Malware solutions focus on fingerprinting techniques. While some have some basic networking detection, they are very weak and rely on fingerprinting and again require detailed analysis. In 2014, 69% of executives expressed concerned about cyber threats, including a lack of data security, according to a PricewaterhouseCoopers survey. In 2015, an updated survey increased that number to 86%, so it’s clear that the desire for better cybersecurity is not going away anytime soon. It is estimated that $655 billion will be spent on cybersecurity between 2015-2020 (Business Insider).